Kate Wright made all of Tia Ferdinand 'dreams come true' on her 8th birthday. 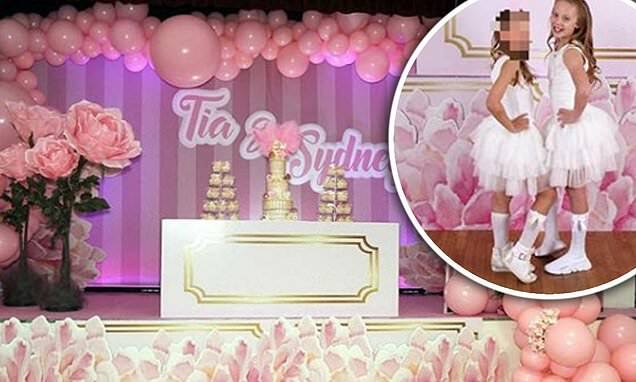 Rio's little 'princess' danced all night at an incredible pink party shared with with best friend Sydney. Kate pulled out all the stops to make it a special day for Tia, transforming a village hall with hundreds of pink balloons and her name written across the dance floor. Keeping the kids happy, Kate ordered up to 40 boxes of takeaway pizza and arranged to have a tower of cupcakes on hand for dessert. Sharing party pictures of the incredible party to Instagram, Kate wrote: 'What a party. Thank you for making our little girls' dreams come true! Kate thanked a collection of vendors who helped make her vision for the party a reality. The previous day, she posed with the delivery men who provided the piles and piles of takeaway pizza ordered for a feast. The girls-only party was complete disco dancing and entertainers to keep party goers amused all day. Down to the finest details, each attendee had place settings with Tia and Sydney's names, their own personalised biscuit and a bottle of water.